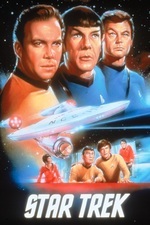 Captain Kirk, along with fellow crew members Spock and McCoy, must find a way to bring peace to a race of aliens whose lives revolve around a dichotomy of honesty and savagery. Adding to their difficulty is the presence of the Klingons, whose sole desire is obtaining what they need through guile and/or violence. "Friday's Child" is episode #40, production #32, and was broadcast December 1, 1967. It was written by D.C. Fontana, and directed by Joseph Pevney. Julie Newmar guest stars as Eleen. This episode explores several concepts: multi-culturalism, negotiation, intimidation and, ultimately, the fight between good and evil. The episode has had mixed reactions from Trek fans. When did Klingons go from shifty Red Menace stand-ins to warriors of honor? Was it just the superb novel The Final Reflection or something in-canon? Astute observers of 1960s US television will recognize the Klingon Kras in this episode as Captain Greer from The Mod Squad. The question is, which is Tige Andrews real hair: that of the balding Klingon or Captains Greer's comb-over? infinitewindow, clearly they needed a different take on Klingons when Worf was added to TNG, but Ronald D. Moore explicitly credits the novel as an influence when he began writing for the show, starting with certain critical Worf-centered stories. Anyway, stupid color-coded alien costumes aside, this was another attempt to delve into the complexity of dealing with an alien culture, and narratively, another Cold War/proxy war/Vietnam metaphor. Still, never a favorite of mine. As an unmitigated Trekkie, I must have seen this episode 8 times since I was a kid. But the title wasn't calling up a strong memory, and I clicked on the Memory Alpha link and the guys in the weird suits were only vaguely familiar. Most TOS episodes are great or awful in a great way, but a handful are just deeply blah. I suspect this is one of those.